Posted by admin in Saturday volcano art, volcano art, volcano culture. 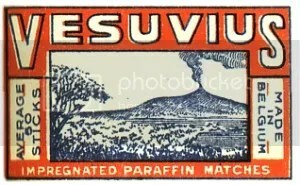 A slightly unusual dose of Saturday Volcano Art this week: volcanoes on matchbox labels. A Volcanism Blog reader sent in these images of matchboxes featuring illustrations of volcanoes, and I thought they were too nice not to share. 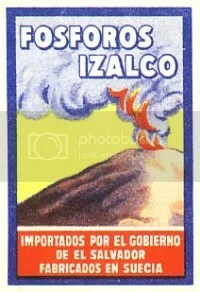 The choice of Izalco for matches imported into El Salvador is an obvious one: the volcano depicted doesn’t look terribly much like Izalco, but doesn’t look terribly much unlike it either. The volcano on the Indian ‘Volcanoa’ matchbox sits quite nicely in its stylized landscape, and the artist has made an effort to depict ashfall. 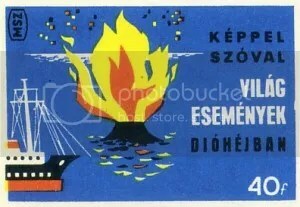 The Hungarian box depicts a vigorously erupting volcanic island, or submarine volcano breaking surface – the ship seems rather dangerously close. The ‘Vesuvius‘ illustration looks to be based on a photograph, perhaps from a postcard, although the depiction of the volcano’s shape is rather wayward. 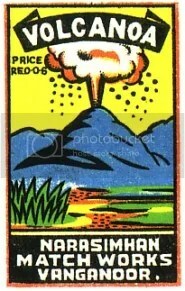 Volcanoes would seem an appropriate subject for matchbox illustrations, so presumably there are more examples like the ones reproduced above. These humble articles are examples of a genuine popular art form, and an attractive and interesting instance of the presence of volcano imagery in popular culture.